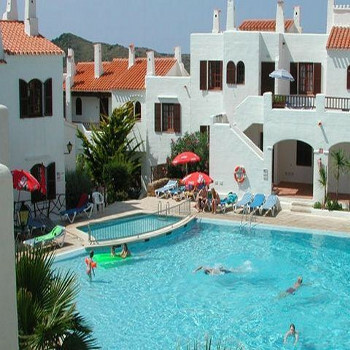 In a peaceful hillside location and set in beautiful gardens, the Tramontana Park Apartments provide a high standard of modern accommodation. In an elevated position within the resort, just 800m from the sand shingle beach. the apartment which we were given was fantastic, a huge verranda the views were outstanding, once again the rooms were spotless and kept clean throughout the week, staff are so friendly and helpful. Resturant again good value, and the staff are very helpful. I just love the place!!! we stayed in tramontana park and it was great it was very clean outside and inside.The staff were very helpful and friendly most of them cld speek english. The entertainment was gd but was only on three nights a week so the other days cld b a bit borin. The rep we had was very helpful and helpted us arrange things to do through out the week. If u want to get away and do your own things then i recomend u get a car. the supermaekt is just up the road and is very resonable.The beach is a 5-10 miniut wlk up the road but is not very big but its great for snorkelling. there is a small climbing frame and slide ect but is very rusty and not safe to go on. all in all tramontana is fantastic i luved it and wld definatly go bck againe. We stayed here summer 2001. Pleasant comfortable accomodation, good day time programme for kids, evening OK most of time . All quiet by 11.30am. Plenty of loungers etc. Food plentiful and usually good. Direct holidays rep was a brilliant girl who tried to be as helpful as possible.Outdoor play area in a very sunny spot...too hot for little ones. I bed room OK but kicthen poorly equiped...not a problem for us because I don't cook when I'm on hols.We were all inclusive which was great value and local gin tastes very good! Silly people though let their little ones spill soft drinks every where so wasps were a bit of a problem during the day. we stayed here in june 2002 and really enjoyed it. rooms nice and clean staff friendly. Only down side was that our apartment was right by pool table etc so we had everyone gathered there till quite late,the kiddy ride had an awful tune which we were humming for months after ha.We thought the entertainment was ok though and there was no sign of ducks! side of cliff bit steep and a worry with the kids as there was no safety barrier at all and quite a drop off the side. All in all a nice place to stay. As mentioned before a car is needed to escape to rest of island though as it's one hell of a walk to the bus stop! This was a wondeful holiday for us and the kids. It made us wonder why we had never tried Menorca or All Inclusive before. We got a hint of what was to be expected the minute we arrived on the island. We got our cases in minutes and were on a clean new air conditioned bus that took us directly to the Tramontana,One downside ithe evening entertainment was diobolical and its a very quiet resort,There is a good beach about 10 minutes walk away with excellent snorkaling, lots of fish and its shallow so it safe for the kids.